What Is a Ganglion Cyst? A ganglion cyst is a sac filled with a jellylike fluid that originates from a tendon sheath or joint capsule. The word “ganglion” means “knot” and is used to describe the knot-like mass or lump that forms below the surface of the skin. Ganglion cysts are among the most common benign soft-tissue masses. 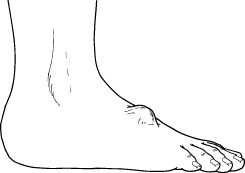 Although they most often occur on the wrist, they also frequently develop on the foot – usually on the top, but elsewhere as well. Ganglion cysts vary in size, may get smaller and larger, and may even disappear completely, only to return later. Although the exact cause of ganglion cysts is unknown, they may arise from trauma – whether a single event or repetitive micro-trauma. To diagnose a ganglion cyst, the foot and ankle surgeon will perform a thorough examination of the foot. The lump will be visually apparent and, when pressed in a certain way, it should move freely underneath the skin. Sometimes the surgeon will shine a light through the cyst or remove a small amount of fluid from the cyst for evaluation. Your doctor may take an x-ray, and in some cases additional imaging studies may be ordered. Monitoring, but no treatment. If the cyst causes no pain and does not interfere with walking, the surgeon may decide it is best to carefully watch the cyst over a period of time. Shoe modifications. Wearing shoes that do not rub the cyst or cause irritation may be advised. In addition, placing a pad inside the shoe may help reduce pressure against the cyst. Aspiration and injection. This technique involves draining the fluid and then injecting a steroid medication into the mass. More than one session may be needed. Although this approach is successful in some cases, in many others the cyst returns. When other treatment options fail or are not appropriate, the cyst may need to be surgically removed. While the recurrence rate associated with surgery is much lower than that experienced with aspiration and injection therapy, there are nevertheless cases in which the ganglion cyst returns.